The knee joint is a very complex structure that is vulnerable to injury in practically all activities. As fitness and sports activities are integral parts of our lives, injuries to the knee occur at alarming rate in all age groups. The knee is injured more frequently than any other joint in the body, but fortunately many knee problems do not require surgical treatment. Some knee problems are not injury related – generalised spontaneous aching and swelling usually suggest a degenerative process or arthritis. Arthroscopy is a surgical procedure which orthopaedic surgeons use to view, diagnose and treat problems inside joints. In an arthroscopic operation, an orthopaedic surgeon makes a small incision in the patient’s skin and then inserts the arthroscope (a miniature lens and lighting system) which magnifies and illuminates the structures inside the joint, viewed on a monitor. Arthroscopic surgery requires the use of a hospital operating theatre. Before the procedure, a patient is given an anaesthetic. The tourniquet (tight cuff above the knee and around the thigh) may be used to temporarily interrupt the local circulation. The leg is painted to disinfect the skin surrounding the knee. Then a sterile fluid is introduced into the knee joint to expand it, making room for the arthroscope and surgical instruments. The surgeon makes a small incision in the skin and inserts the arthroscope. Usually 2 to 3 incisions, called portals, are necessary in order to examine the inside of the joint. A surgical instrument is used to probe various parts within the joint to determine the quality of the tissue and extent of the problem. If surgery is indicated, it is performed with specially designed manual or power-driven instruments that are inserted into the joint through the portals. A selection of your arthroscopic images will be recorded and stored digitally, and kept as a part of your medical record. Although uncommon, complications do occur occasionally during or following diagnostic and surgical arthroscopy. They include excessive swelling or bleeding, skin and (extremely rarely) joint infection, phlebitis, blood clots (DVT) and very rarely technical problems with arthroscopic instruments. There are also anaesthetic risks, both during and after the procedure, but they are minimal. This is one of the major stabilising ligaments within the knee. It connects the thigh bone (femur) to the leg bone (tibia) and prevents abnormal movement (instability) occurring between the two. More specifically it provides rotatory stability to the knee to allow movements such as pivoting or sudden change in direction to occur without the knee giving way. If your knee is giving way regularly and this is interfering with your quality of life, you may want to consider an operation. This instability may occur during sport or during activities of daily living. Most patients who want to return to pivoting sports will require a reconstruction to prevent their knee buckling during these activities. ACL reconstruction is not an emergency operation. Delaying surgery until a full range of motion is obtained significantly reduces the chance of having problems post-operatively. Delaying acute surgery also allows the patient to be mentally better prepared for surgery and gives the patient time to learn, fully understand and practice adequate exercises. In the majority of cases we prefer to rehabilitate your knee prior to undergoing surgery. This involves controlling the swelling, regaining the movement in the knee and preventing or limiting the loss of strength in the muscles around your knee. This period of rehabilitation can take up to 6 weeks. You will be admitted to hospital on the day of your surgery. Your anaesthetist will discuss with you the type of anaesthetic you will have and your options for post operative pain relief. Most patients have a general anaesthetic. Antibiotics are delivered via a drip to decrease the risk of developing an infection. Two of your hamstring tendons (gracilis and semitendinosis) will be removed from the back of your thigh through an incision on the front of your knee. This is done with a special instrument called a tendon stripper. In some cases an alternative graft may need to be used. An Arthroscope is used to inspect the inside of your knee for any associated damage. If any is found (eg. 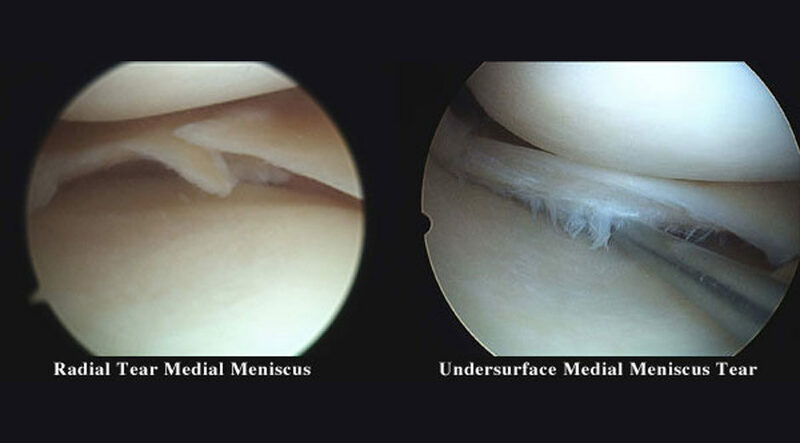 a meniscal tear), it will be addressed at the time of surgery. A tunnel will be drilled in the top of your leg bone (tibia) and the bottom of your thigh bone (femur). The tendons will be passed through these tunnels and anchored in place with specialised to provide stability to your knee. Your knee will be injected with local anaesthetic to help with your post operative pain control. All your wounds will be closed using a combination of normal and dissolving sutures. Your leg will then be wrapped in a well-padded dressing prior to leaving the operating theatre. A brace is not usually required after your surgery. You will be seen by a physiotherapist who will provide instructions for exercises for you leg that can be performed immediately post surgery. You will be able take all your weight through the operated leg after the operation. The majority of patients are able to be discharged home the same day as their surgery. During the first week at home your knee will be swollen and feel stiff. It is normal to require regular pain medication during this period. It is of utmost importance that you perform your rehabilitation exercises regularly whilst at home so that you get the greatest possible benefit from your surgery. You will need to organise a post operative visit to your surgeon 10-14 days following your surgery. Rehabilitation after an ACL reconstruction takes approximately 6 months. During this period you will take part in a structured rehabilitation program with your physiotherapist, and gradually return to your normal activities. This process is designed to safely improve the strength, motion and balance (proprioception) in your knee. You will have follow-up visits with your surgeon at 2 and 6 weeks, then three, six and twelve months after your surgery. Suitable for patients with arthritis effecting only part of their knee joint. Numerous studies have demonstrated 90% or greater 10-year survival rates with unicompartmental knee replacement systems. The newest implant systems for unicondylar arthroplasty provide both implants and instruments that are designed specifically for minimally invasive surgery. Medial unicompartmental knee replacement has many advantages over total knee replacement (TKR). As all the undamaged structures of the joint, in particular the cruciate ligaments, are preserved, knee function can be restored to nearly normal. After UKR the range of movement is better than after TKR, the knee feels more natural and pain relief is as good or better. In terms of morbidity, operative blood loss is minimal and transfusion is usually unnecessary, complications are less frequent and less serious and recovery is more rapid. The main indication for unicondylar knee replacement is medial compartment osteoarthritis. The anterior cruciate ligament should be functionally intact. Fixed flexion deformity should be less than 15°. Varus deformity should be correctable and there should be full thickness cartilage in the lateral compartment. Knee X-rays, taken while standing, must show complete loss of joint cartilage in the medial compartment. Lateral unicompartmental replacement is still controversial, although several surgeons claim good mid- to long-term outcomes. Total knee replacement means resurfacing the bones of your knee joint with a prosthesis. Of the three surfaces in your knee that may become roughened and painful, you may need two or all three surfaces replaced. Like a normal knee, your implants have smooth weight-bearing surfaces. The femoral component covers your thighbone, the tibial component covers the top of your shinbone, and the patellar component (if used) covers the underside of your kneecap. All components are usually cemented to prepared bone surfaces. Indications for knee replacement surgery have expanded during the last decade. During the 1970s and 1980s, knee replacement surgery was performed mainly for pain, disability or deformity. The expected benefit from the operation was reduced pain, limb realignment and functional improvement. However, pain was the primary reason for knee replacement surgery. As we enter a new century, function is a primary reason for knee replacement surgery. Patients are not satisfied with the reduced function that can accompany a stiff, painful arthritic knee and they are demanding knee replacement operations to improve their function. Once your new joint has completely healed you should experience following benefits of the surgery: significantly reduced or no joint pain, increased movement and mobility, correction of angular leg deformity, increased leg strength (if you exercise! ), improved quality of life and the ability to return to most normal activities and pastimes.